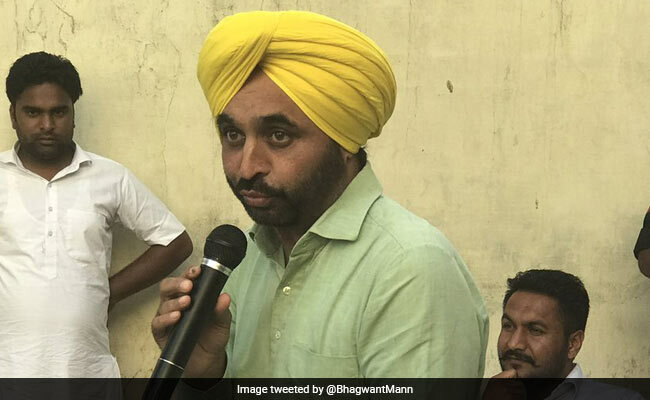 Lok Sabha Elections 2019: "Our performance in the Lok Sabha polls will be better than the last general elections," said Bhagwant Mann. The Aam Aadmi Party's Lok Sabha poll performance in Punjab will be better this time compared to the 2014 elections, claimed party Lok Sabha lawmaker Bhagwant Mann, while dubbing the Punjab Democratic Alliance as ''Personal Democratic Alliance''. The Punjab Democratic Alliance (PDA) includes the Punjabi Ekta Party (PEP) and the Navan Punjab led by suspended AAP leaders Sukhpal Singh Khaira and Dharamvira Gandhi respectively, the Bahujan Samaj Party (BSP), the Lok Insaaf Party, the CPI, and Revolutionary Marxist Party of India. The alliance has fielded candidates in nine of the 13 Lok Sabha seats in Punjab. Alleging that the Shiromani Akali Dal (SAD) was facing public anger over the 2015 sacrilege incidents and subsequent police firings, and the Congress was reneging on its poll promises, Mr Mann claimed that Punjab voters will support AAP, the state's principal opposition party, in the general elections. The 45-year-old lawmaker from Sangrur said, "Our performance in the Lok Sabha polls will be better than the last general elections. I will not talk about the number of seats, but it is certain that we will come out stronger." "We won four seats in the last general elections when the party lacked any organisational structure. But this time, we have a proper structure in place and we have people at village, block and district levels," said Mann, who is seeking reelection from Sangrur seat. Punjab was the only state where AAP registered victory on four seats - Patiala, Sangrur, Faridkot and Fatehgarh Sahib in the 2014 Lok Sabha polls. However, retaining its seats is not going to be an easy task for the party given the factionalism and internal bickering it had faced. Slamming the Punjab Democratic Alliance, Mr Mann, who the Punjab AAP president, said political parties which are part of this tie-up are each are represented by a single leader. "Sukhpal Khaira is the single leader in his own political outfit (Punjabi Ekta Party). Dharamvira Gandhi is also the single leader in his own party (Navan Punjab Party). The Bains brothers have their own party (Lok Insaaf Party). This PDA is personal democratic alliance. Their candidates will face forfeiture of their security deposit. People are not going to waste their votes on them," he claimed. The AAP leader said issues such as unemployment, farmer suicides and mafia raj be raised during the hustings and the party is showcasing the "Delhi model of governance" while canvassing for votes. Meanwhile, AAP leader and Dirba assembly lawmaker Harpal Singh Cheema said the party will be contesting Lok Sabha polls on its own. Earlier, talks for alliance had taken place among the AAP, SAD (Taksali) and the BSP, but it remained inconclusive.